Quitting isn’t always giving up. In fact, sometimes quitting or abandoning some things can be good for the soul and can help get you back on track. Most people don’t believe this, though. That’s because we’ve been trained to “finish what we start” and to “never give up”. We’ve been trained to bypass challenges and push through the storms in life. Which is very true, I must add. We must be able to know which battles to fight through. But we also must know when enough is enough. I met up with some college friends recently over ice cream and was super excited to catch up with them about what they were currently doing. 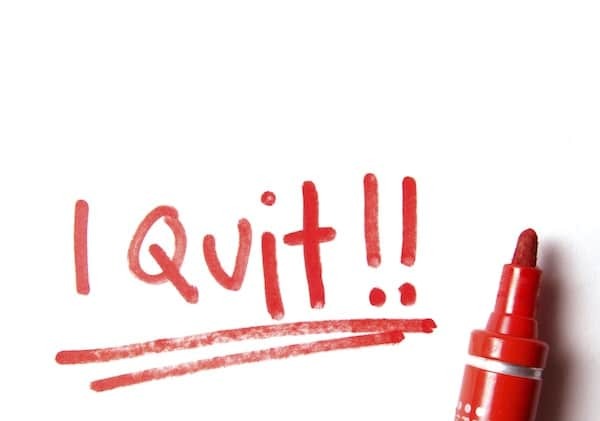 Without speaking too boldly, one of my dear friends mentioned that she had quit her job. Eyes grew wide. The room quickly went silent. Now, this is the part where many of you may be shaking your heads, uttering disbeliefs as to why a young college graduate would leave a paying job during a recession. It sounds bizarre right? Not when you consider how the job may have had more personal costs than benefits in your life. My friend went on to explain how the opportunity she pursued had not turned out to be as exciting as she had perceived it to be. Not because it came along with the entry level grunt-and-grind that most newbies to the job market experience. But more so because it wasn’t mentally stimulating enough, didn’t allow room for self-development, and wasn’t really pushing her in the direction of her calling. She wasn’t fulfilling her purpose nor was she on the path to doing so. And that gut-wrenching realization made daily work miserable. It made getting up on Monday, Tuesday, Wednesday, and Thursday a chore. It made her question her worth in a corporate world filled with workplace politics and old-school bureaucracy. And despite the little perks, it had become spiritually exhausting and bland. Her boss, surprisingly, had agreed. As other stared with confusion, I couldn’t help but to smile and dap her up. She knew when to call it quits. And I hope you do too. Knowing when you’ve reached a dead-end in life is a transformative moment. Not just because you’re able to discren the pain and unhappiness that work brings to you but because you are now able to realize the many other possibilities that are out there that can provide you the growth and development that you need. This doesn’t mean give up on something when you have yet to see its end result or because you may have failed at it once or twice. It means knowing when something isn’t “feeling right” or in line with your spirit. If you find yourself simply “living” rather than existing then it may mean that you have reached a cul-de-sac in life, a space in which you are complacently driving around in circles with no end in sight. It’s okay if you need to step back in order to step forward. It’s okay if you need to call it quits and start a new. Because if you’re soul isn’t happy — if you are not inherently bubbling with excitement at the thought of work — it will show. I have many of moments like this. When I’ve walked into what I considered my dream job and found myself, days, weeks, or even months later feeling stuck and finding my talents underutilized. It’s a miserable feeling, one that makes you feel trapped and imprisoned. But there are ways out. The first is to stop and reassess your position in life and what you want. The second is to “call it quits” on whatever is not providing you happiness or resound and finding an alternative route towards your dreams. This is important and something that I hope you grasp when looking at all parameters of your life. Not only can work leave you feeling stumped. Have friends in your life that are using you more than supporting you? Don’t be afraid to cut them loose and make new ones of value. Have a fitness plan that isn’t giving you the results that you want? Consider trading in your old run-of-the mill treadmill plan for some weights and a pilates class. The only thing bad about “calling it quits” is when you don’t move forward in a new direction. Quitting should never be a dead-end and you should never consider quitting on life. Rather it should be seen as a slight pivot on your roadmap. Or rather what I’d call: a damn-good life altering change for the better. Follow your bliss and know when it’s time to throw in the towel — in order to grab a new one.